Detroit's top pick in the 2000 NHL Entry Draft. The 2007-08 season is shaping up to be a breakout year for several NHL players. The dynamic play of Washington's Mike Green is rivaled by the heroics of the Coyotes' Ilja Bryzgalov and Pascal Leclaire of the Columbus Blue Jackets. Several rookie forwards are having superb seasons, among them Green's teammate Nicklas Backstrom, Patrick Kane of the Chicago Blackhawks, and Andrew Cogliano of the Edmonton Oilers. Detroit Red Wings head coach Mike Babcock believes he too has a success story in Swedish defenseman Niklas Kronvall. "I think Niklas Kronvall will continue to develop and be a strong offensive guy for us," Babcock said. "With Brian Rafalski and Niklas Lidstrom, plus Kronvall, it gives us three real puck movers. Brett Lebda, Andreas Lilja and Chris Chelios can move the puck, but the other three are all guys you can count on offensively and are among the top scorers in the NHL on the back end. In today's game you need offense from your defensemen." Kronvall is an exceptional skater with great hockey sense and those talents allow him to join the Red Wings rush as the fourth attacker and even step into the deep slot to one-time the puck. Some regard Kronvall as the next dominant European defensemen. "I think he's great," says New York Rangers Brendan Shanahan, who spent nine seasons in Detroit. "Kronvall just had some bad luck with injuries, but if he hadn't been hurt the first few years of his career I think he would be an All-Star by now. Kronvall has offensive upside. He is a big hitter and a great skater. This guy is just a great player that the NHL hasn't seen enough of yet, because he has had some freakish injuries." This season, unfortunately, has been no exception. He missed 13 games in February to a sternoclavicular joint sprain, but has jumped back into the game in a big way, picking up four assists in his first two games back. Kronvall showed his stuff early in his professional career, but serious injuries derailed his emergence as the elite player the Red Wings projected him to become when they drafted Kronvall 29th overall in the 2000 Entry Draft. "Injuries have set me back a little, but there's not much you can do as it's part of the game," Kronvall said. "I have to work as hard as I can to get to the level of where I want to be. When you are trying to get back after being out of the lineup, you sometimes force things. You want more than you can really produce and end up stressing yourself and making wrong decisions. I still need to make better decisions, when to jump in and when not to jump in. But all of the veterans on this team are an inspiration to me. When you look around this locker room you see Chris Chelios, Dominik Hasek, Nicklas Lidstrom and what they do is absolutely inspiring. They come to work every day and they just show up every night. That's what you look up to as a younger guy establishing himself in this organization. I look at them and realize that's where I want to be." Kronvall began his professional career in 2003-04 with Detroit's American Hockey League affiliate, the Grand Rapids Griffins. He appeared in 20 games for Detroit that season, but was injured during the warm-up prior to a game against the Los Angeles Kings and missed the remainder of the season. The next season Kronvall led the entire Grand Rapids squad in scoring with 53 points in 76 games and became the first European-born player to win the Eddie Shore Trophy as the AHL's top defenseman. "Kronvall would have come on a bit earlier, but he had quite a few setbacks with those injuries," Ottawa Senators captain Daniel Alfredsson said. "Niklas is such a good skater and, especially under the new rules, he is able to join the rush and get the rush going. He is not a big guy, but he can really throw the big hits because he's got great timing. "I played with Niklas in the 2005 World Championships and he was unbelievable," Alfredsson said. "I hadn't seen him before (that event), so he caught me a little by surprise but he was outstanding. I thought for sure that he was going to be the next star offensive defenseman in the NHL. I think he has the potential to be one of the best in the League." Kronvall is not just an offensive force. He relishes physical play. Although not a huge defenseman at 6-foot, 189 pounds, Kronvall hits like a behemoth. "He certainly does," Lidstrom said. "Kronvall is so good at reading the play, timing the big hits, and he is strong on his feet. He's got strong legs, good balance, and he is so good at stepping up for that big hit. That's one of the elements we're looking for on this team because we don't have many guys who are real big hitters. He is a guy that can step up and make that open ice hit." Niklas Kronvall has five goals and 26 assists, with a plus-23 in 53 games played this season. One might think that a player who has missed the major parts of three seasons due to a broken leg, torn knee and fractured sacrum would be tentative about physical confrontation, especially when the player is gifted offensively. But Kronvall wants to be the complete package. He admits that timing is the secret behind his punishing bodychecks. "I think it all comes down to timing," says Kronvall. "You don't have to be 6-5 and 240 pounds. It's all about timing. If you hit a player at the right spot it doesn't matter how big you are or how much you weigh. Hitting is something I've always enjoyed doing. You hit and get hit and that's part of the game." "And he is good at it," says teammate Dan Cleary. "The first thing that comes to mind about Kronvall is he has great awareness on the ice. He hits with gusto and has great balance. Then when he gets the puck he is so fluid with it, efficient, a good passer, and sees the ice well. Kronvall is going to be a great defenseman. He is only now starting to show what he can do as a complete defenseman." "Kronvall was such a huge loss for us last year," Cleary said. "People didn't even realize how big he was for this team when he got injured (and missed the playoffs). But this year he has been quite healthy and is a big part of our defense, moving the puck, and playing on our second power play. That's why our transition game is so good. It's the defense moving the puck. Kronvall is a budding superstar in the weeds." Kronvall's boyhood hero has seen a huge improvement in his play. "He is playing real well for us this year," Lidstrom said. "He has had a series of injuries in the past that slowed him down, but he has been healthy for most of this year and has settled down into his role as a top four defenseman. He is picking his spots, when to get into the rush and when to get up into the play. I think when he came back from injuries he pushed a little more because he wanted to be part of the offense and show people what he could do. But now he has settled down, is real sound defensively, and very seldom gets beaten one-on-one or in his own end. I think he is playing a lot smarter than ever before and joining the rush at the right times. He knows when to be part of the offense." For Kronvall, the journey has just begun. 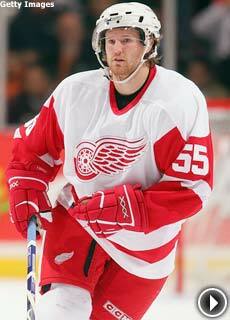 "I've seen him for a handful of years and knew what the potential was," says teammate Kirk Maltby. "Unfortunately he plays a lot bigger than he is and ends up with injuries that maybe if he was a little bigger he wouldn't have got but he is undoubtedly a great player. 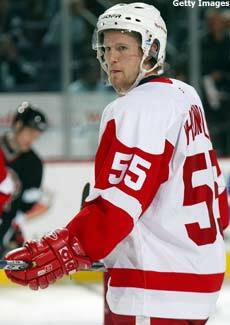 He is going to be the guy that fills Nick Lidstrom's shoes when Nick moves on. Niklas Kronvall is definitely coming into his own this season."